Cooper launched from Kirks point which is located towards Corio bay heading to Geelong. Hitting the water in the late afternoon and headed towards Wedge Split. On their travels he noticed some heavy patches of weed and anchored where sand was clearly visible. Fishing on only 4 meters deep he fished with small pieces of Pipis to a small running sinker rig. He was also casting Savage Gear black UV grubs. First there was an avalanche of small pinkies which were taking baits on the drop. Most undersize, but with some persistence the whiting and some bigger pinkies started to come on deck. Cooper was fishing with his new 1-3 kilo rod. Looking to break it in he suddenly got a huge take. 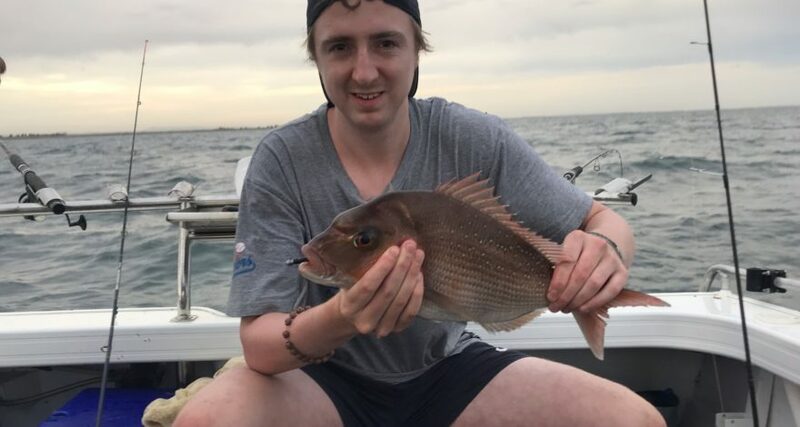 After struggling to bring the fish on deck for a few minutes he landed a beautiful Port Phillip Bay snapper. That had engulfed the Black UV grub soft plastic. Was a great evenings fishing landing many size fishing. Including whiting, many size pinkies, plus a couple of snapper, leather jackets and flathead.